3rd April 2011 Added the March Meeting Report. "January - Radar and Chain Home Film, Renewing YOUR License." 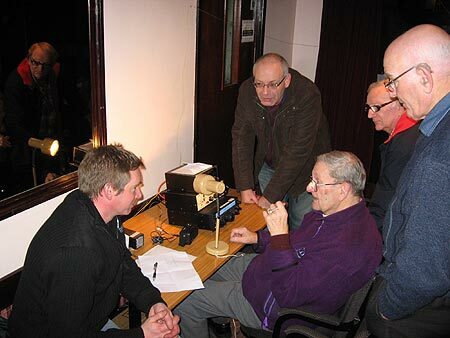 As a continuation to CARS Operating GB75CH from Great Baddow to commemorate 75 years of Marconi involvement with Radar and Chain Home we showed a film about its development. This was a really good film and explained possible reasons why the Germans never really found out about the English use of Radar. This was a change to our published programme in RadCom, partly due to last year we had to cancel the January CARS Meeting due to bad weather and with the adverse weather we have already had - we felt we cannot request people to travel long distances at this time of the year. 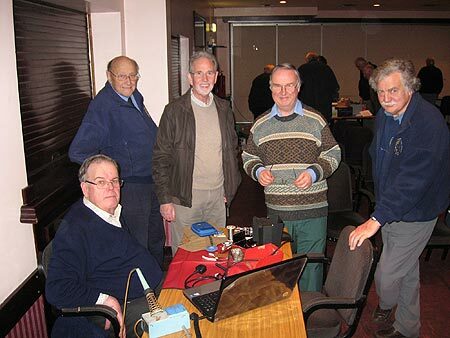 The idea was that at the same time the film was being shown we will have a couple of work stations connected to the Internet & Ofcom to Re-License Amateur Radio stations Licenses. Unfortunately for the first time at MASC - the "3" Internet signal disappeared! This meant we could only talk about "Re-Licensing your Licence" - not actually doing it. However a number of CARS Members did fill in the questionaire and have now been Validated. If you would still like to Re-License YOUR License - please contact the Chairman or a Committee Member. 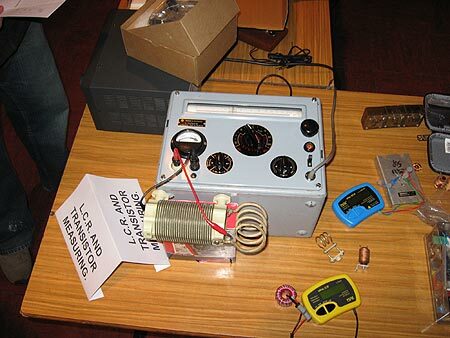 Although it was proposed to have a Practical Soldering Demonstation and a Transmitter tune-up - we ran out of time. CARS had its now famous Raffle with at least 10 prizes - drawn by Marc from LEFARS - lovely to see you Marc. "VP8CR – Two Years in the Antarctic". By Prof Les Barclay, G3HTF. The club would like to thank Prof Les Barclay for a most informative and first-rate presentation describing his experiences with the Royal Society Antarctic base at Halley Bay. 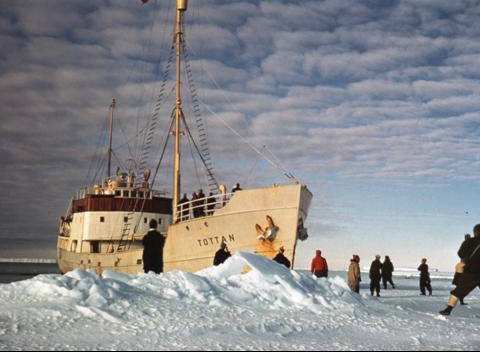 The base was established on sea ice in 1956 for the International Geophysical Year (IGY) 1957-58. Les described how the IGR had evolved from earlier meteorological polar research as far back in time as the first international polar year in 1882, the intention then being to mount a polar year every 50 years. A second polar expedition took place in 1932 and much information was gained into the world weather patterns. The period was subsequently shortened to 25 years with the next event taking place in 1957–58 as part of the IGY. There is now a permanent base in Halley Bay. Les Barclay, VP8CR Halley Bay. 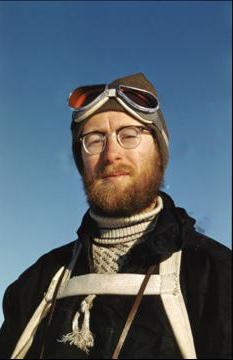 Living in the Antarctic 50 odd years ago was much more comfortable than for the expeditions of the “heroic” era 50 years earlier, but was very different from the way of life there today. Supply Ship "Tottan" - high and dry. An advance party had erected a large prefabricated wooden building to house the expedition, to accommodate the personnel and instrumentation. A separate building housed the large diesel generators, which were accompanied by 800 drums of fuel. Radio communications were maintained with the help of two rhombic aerials principally orientated for London, Port Stanley and Australia. The aerials were supported by tubular guyed masts with “dead man” anchors. For ionospheric soundings a large delta antenna was deployed and orientated to produce high angle for the radiosonde equipment. Les setting out on a 50 mile walk. With the help of many excellent photographs Les described the life in the hut and the conditions under which they worked with the blizzards, wind and whiteouts, together with the penetrating cold. In a relatively short time the huts were buried beneath the snow and access had to be dug to doors and frequently cleared. As time went on the roof was covered and it became necessary to extend the chimneys and flues to clear the snow. Sometimes it was necessary to exit the building via the attic and the roof space. The expedition was in touch with nearby bases with aircraft and these supported the base with additional provided medical assistance. Measurements within the research programme included weather patterns, the ionosphere, atmospheric ozone and the aurora. Maps were drawn of the area and the motion of the sea ice monitored. 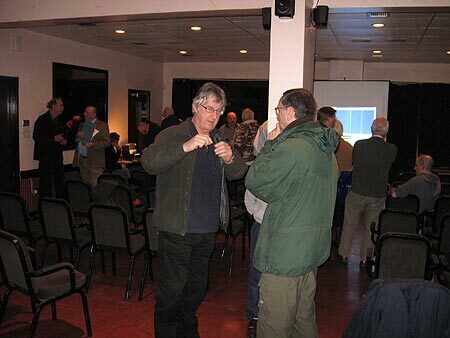 Les presented several slides showing the remarkable life of the Emperor Penguins and of his reception of BBC Band-I television sound signals using a home brew Yagi. This event coincided with an exceptionally high solar sunspot maximum. 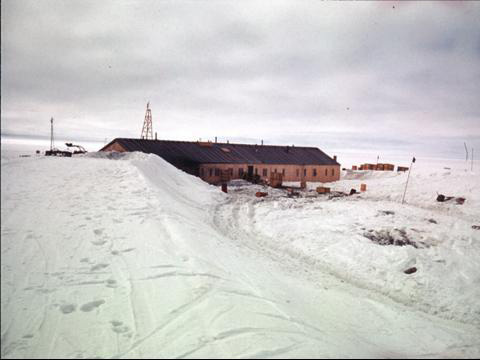 The expedition ended in 1958 and the old hut was eventually abandoned. During the passages to and from Halley Bay both supply ships became stuck in the ice and required human assistance and gelignite to free them. 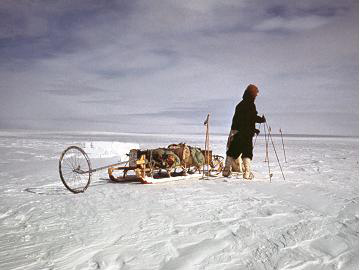 The talk was a first-hand account of life in the Antarctic in 1957 and of an expedition that changed the scientific and political landscape of the world for the better. Post Meeting Note by President, Carl, G3PEM. That was a good talk by Les, and nice to see the early photos. Seeing the ship Magra Dan reminded me that when I was at the University of Southampton, Navigation College in late 1958/ 1959, when the ship returned it was at Southampton Docks for a short while and I went on board and was shown over it. The owners of the vessel were “J.Lauritzen”. My Aunt was his Personal Secretary in the Copenhagen office. My Cousin started work in the 1960's for the British Antarctic Survey and has just retired as the Chief Geologist. Thanks Carl – That adds a personal touch to a wonderful story. 7.30pm, Tuesday 1st March, 2011. "“quod erat demonstrandum - Q.E.D”. which is to be demonstrated. 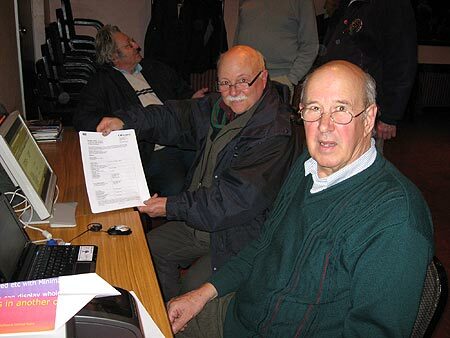 Or in English “Quite Easily Done"
Unfortunately our scheduled Lecturer was still not well enough to travel to Chelmsford so the CARS Committee decided to continue with the January Meeting which ran out of time and to add a little to encourage our new Members to communicate using Amateur Radio. Ken Dews G3PMW (right) booking everyone in with Denis Lewis M0FHA seated on the table assisting. A number of tables were set up around the room while the central area was for having a social natter. 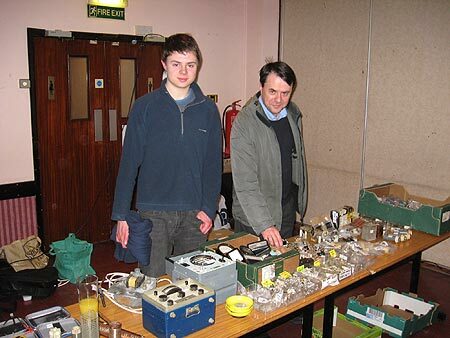 SEARS Secretary, Norman Crampton M0FZW (left) having a natter with Patrick, M0XAP. 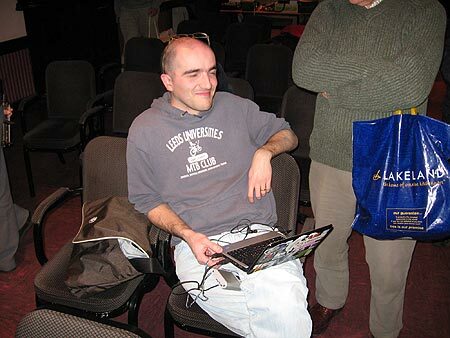 Computer expert, Roger Pettett, G7TKI holding his SDR and laptop while talking to someone clutching a Lakeside bag. David and Myra Davis greeted Members and visitors to make them feel welcome. 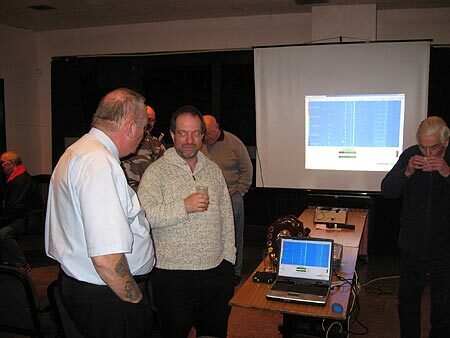 CARS own a SDR-IQ Receiver and this was demonstrated using the Digital Projector and screen. This showed the Waterfall Display of the RF taking place in the room. Unfortunately the Aerial on it was a bit too short and the noise level from the building was rather too large but the SDR created plenty of interest. Thanks to Mark, M0IEO for operating it during the evening. Mark, M0IEO (left) talking to Andrew, G1GKN about the SDR. Another table had the CARS FT847 rig on it connected to a G5RV Aerial outside for local QSOs. The opportunity to practice tuning the ATU to the aerial in readiness for IMD in a month’s time was taken. Club Call-Sign GX0MWT was used. It should be noted that the G5RV Aerial was developed while Louis was employed by Marconi in Chelmsford. Brian, G3CVI discussing the Artificial Earth box. From right to left; - Graham Leggett G7JYD, Oliver Prin 2E0WAA, Brian Debenham 2E1RMD and Colin Wilson, M1OCN from Maldon. If the large copper wire connected from a rig to the outside RF Earth is a critical length it may result in the rig not seeing the Earth at all. An Artificial Earth was demonstrated by Brian, G3CVI. A Member caused a surprise by stricking a neon on the Earth Wire! President, Carl, G3PEM set up a table and had a go at doing a little soldering. President Carl G3PEM and his soldering table. Behind Carl is Tony G4YTG, not known, Sean Jones SWL, and Tony Froom, M0ORF from Maldon. Chairman John, G8DET had a table with a computer and printer connected to the Internet to enable Members to Re-Licence their License. 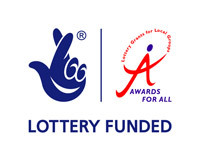 Two were Registered but only one was Validated due to entering the wrong data! Validated with Ofcom help the next day. 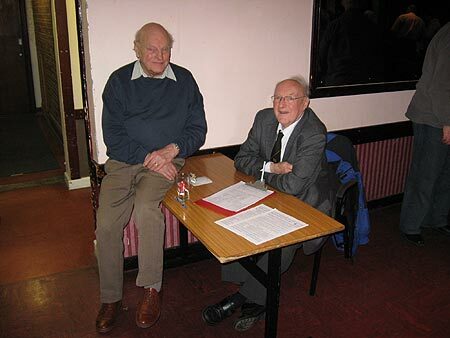 Chairman John G8DET seated next to a Member showing a successfully Validated Licence - holding the paper print-out to prove it. On another table David Penny, G3PEN from Braintree had a whole collection of interesting items including a "Peak" Transistor Tester and a LCR Bridge. 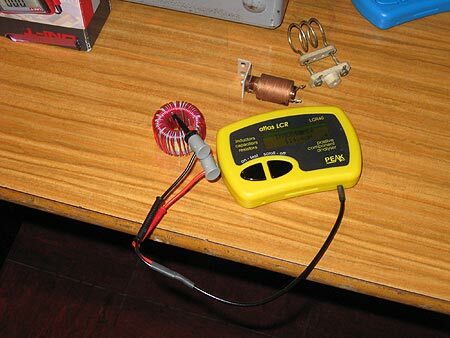 David tested a number of components including transistors and coils. Colin Page, G0TRM also had an Inductance Bridge to demonstrate and made comparison measurements with David's Peak LCR Bridge. Richard M0SBU and Peter Meadows M0ZBU having a look at the goodies - The Peak LCR Bridge measuring 114micro Henry Ferrite coil. 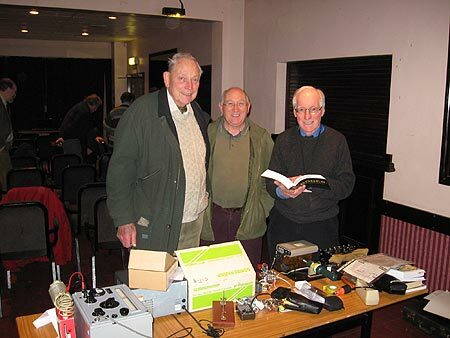 CARS Vice President Charles G0GJS, Bob Tavener M0CSV with Colin G0TRM refering to the manual for his LCR Bridge (right). sending Morse from a punched paper tape. He also had a laptop running showing the internal workings of an Enigma machine. Another table had Peter Bridgeman, G3SUY with a computer to demonstrate an Aerial Prediction Program. 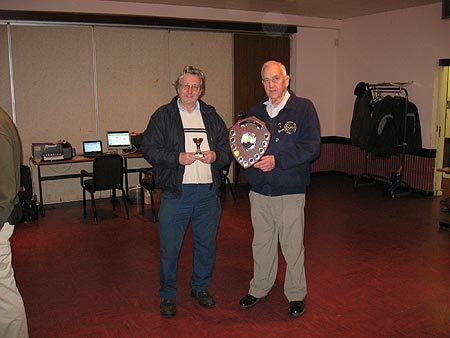 Peter Franklin G1FOA and Vice President Geoff G3EDM holding the Dengie Quiz Trophy which CARS won the previous evening. A very interesting and enjoyable evening was had by all. CARS had its now famous Raffle with at least 10 prizes - Luc from SEARS drew his own ticket first.